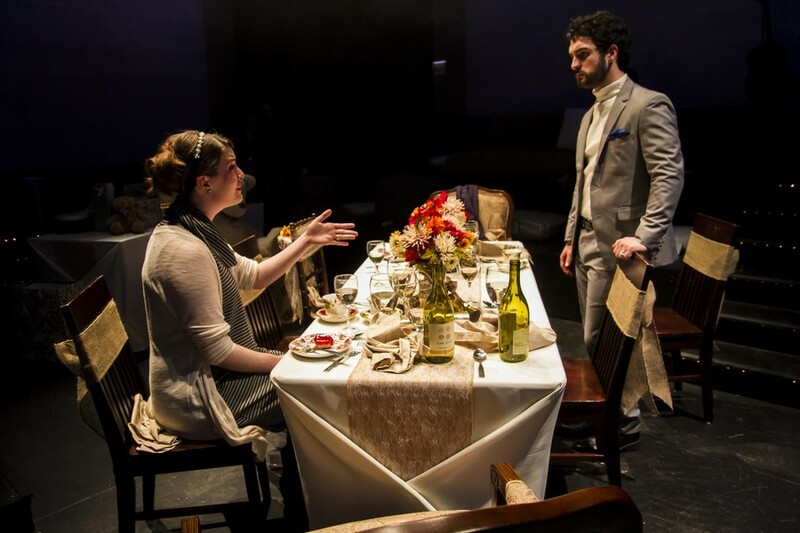 Hermione (Michaela Voit, fourth year) confronts Leontes (Alex Morales, fourth year). One step inside Logan Center’s Theater West, and I found it transformed. Bean bags adorn deep risers and pillows surround the beginnings of a holiday banquet. Wine glasses and gold-wrapped gifts shimmer under the glow of string lights. Audience members are offered snacks and candies from small platters. It felt almost as if the performance of University Theatre’s A Winter’s Tale had already begun even before the actors even took the stage. The instant intimacy of the setting promised what any good Shakespeare production should: theater up close, evocative, and timelessness. But this wasn’t any old Shakespeare of course. Director Shade Murray, a lecturer in the University’s Theatre and Performance Studies (TAPS) department, chose a unique adaptation. Before the show could even start, the Backstreet Boys’ “I Want It That Way” suddenly piped into the cozy space. Various pop songs from across the decades soon followed. Two guitars, a cello, and various other instruments around the room indicated that music was going to play a key role in this adaptation. A Winter’s Tale quickly dove into 70 minutes of drama and tragedy. King Leontes of Sicilia suspects his pregnant wife, Hermione, of a love affair with his visiting friend King Polixenes of Bohemia. Consumed by jealousy, he orders nobleman Camillo to poison Polixenes. Camillo disobeys and flees with Polixenes to Bohemia. Tension continues to mount as Hermione’s fidelity is questioned publicly and the still-enraged Leontes imprisons her. However, the play maintains a sense of lightness and humor all the while, driving toward an eventual happy ending. This is exactly as it should be, even as indicated by the title. A Winter’s Tale is not so much a seasonal indication but a reference to an “old wives’ tale.” The familiarity of the emotions in the play—love, jealousy, and redemption—and the assurance of a peaceful resolution by the final act are both part of its charm. Despite this straightforward, comfort food type plot, the adaptation strives to innovate. Performers take up instruments during emotional moments and sing reimagined and loosely iambic pop songs. At their strongest, the songs are creative and powerful. They draw a compelling connection between the four-century-old text and our experience of the present. Other times, this musical element brings the pace to a near standstill, during which the audience began to fidget. Fortunately, A Winter’s Tale delivers in its second half. An impressively staged storm sets in as a character hides Hermione’s newborn daughter in the Bohemian countryside. As he flees, the production offers one of its most memorable moments when an oversized teddy bear atop a mound of presents is given the spotlight in perhaps the most quoted line of the entire piece: the simple stage direction, “Exit, pursued by bear.” I found myself desiring similar succinctness from the production elsewhere. Sixteen years pass in (celebrated UChicago Shakespeare scholar) David Bevington’s performance as Time. Hermione’s daughter Perdita, raised by shepherds and now grown, falls for Polixenes’s heir. Their love drives their two families back together in an almost reverse Romeo and Juliet situation. A Winter’s Tale requires a strong cast to breathe warmth and life into its tidy plot. TAPS does not stumble in this regard; Michaela Voit and Grace Bolander give especially emotional performances as Hermione and Paulina. The sheer number of musical numbers performed throughout adds interest even when the songs themselves fall short. In the end, the spirit of the play not only survives but strikes a definite chord—a fun and uplifting one that guarantees another week of successful performances. Logan Center Theater West, Thursday, October 6 at 7:30 p.m.; Friday, October 7 at 7:30 p.m.; Saturday, October 8 at 2 p.m. and 7:30 p.m.; $6 advance/$8 door.